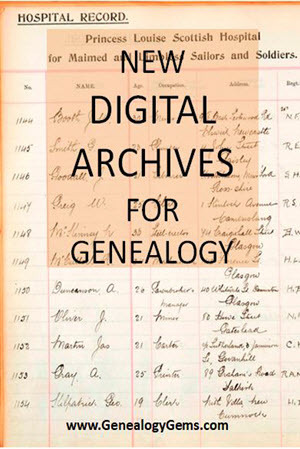 Do you use digital archives in your genealogy research? You should! Check out these new digital archives relating to notable women in the U.S. and Sweden; Scottish WWI hospital records; the WWI Armenian genocide; Ohio; Irish-Americans; and African-American military service. Bonus: we also provide quick links to new archives for Kansas in WWI; historic Montana; post-WWII Manchester, England; vintage Tacoma, WA; and colonial Florida. Irish-American resources at the Library of Congress. 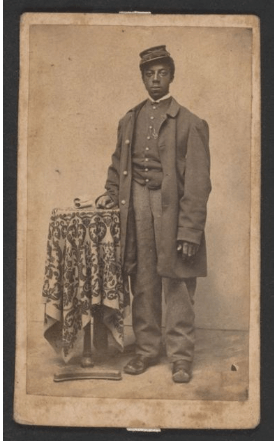 The Library of Congress announced recently on its blog the release of a new guide to researching the Irish-American experience and new images in its “Free to Use and Reuse” archive. The latter features “sets of themed content: travel posters, presidential portraits, Civil War drawings and all manner of dogs,” explains the article. “All the sets highlighted in the archive—and these are just a few examples—are fee to use and reuse, meaning there are no known copyright restrictions associated with the content, and you can do whatever you want with it.” New content comes from various Library of Congress collections relating to folklife, maps, music and prints/photographs. Women’s obituary collection in the New York Times. “Since 1851, obituaries in The New York Times have been dominated by white men. Now, we’re adding the stories of remarkable women.” So states the home page of Overlooked, a new obituary collection at the New York Times website. The site goes on to explain how they will be adding belated obituaries—short biographical sketches—of women and others whose lives deserve recognition. You can read about many, search them and even suggest nominees for the series. Oral history archive of Armenian genocide. The USC Shoah Foundation “has received one of the largest collections of testimonies from survivors of the Armenian Genocide” of World War I, PR Newswire recently reported. More than 1,000 oral history interviews comprise this collection. Only a small number appear online presently; more will be added as the files are digitally remastered and indexed. Click here to learn more about this collection. Biographies of notable Swedish women. The Chicago Evening Post reported recently on a new online biographical dictionary of women in Swedish history. The site itself is Svenskt kvinnobiografiskt lexicon (it does have an English-language home page). Its home page encourages visitors to “Read up on 1,000 Swedish women from the Middle Ages to the present day. Use the search function to reveal what these women got up to, how they were educated, which organisations they belonged to, where they travelled, what they achieved, and much more. All of them contributed in a significant way to the development of Swedish society.” According to the Chicago Evening Post, the current collection of 1,000 biographical sketches will soon double (at least). 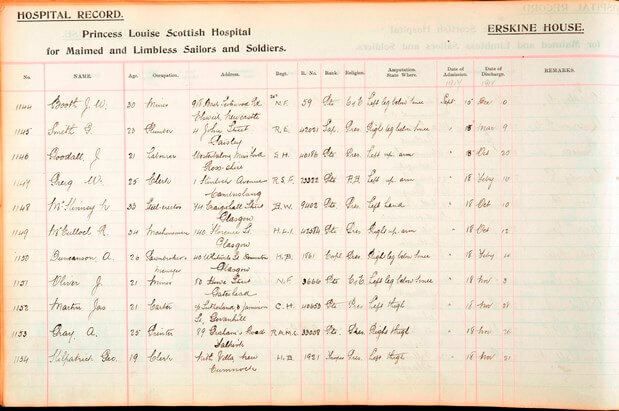 Scottish WWI hospital admissions. The records of a hospital that treated WWI wounded have been digitized and put online. “Erskine Hospital [in Renfrewshire, Scotland] – then called the Princess Louise Scottish Hospital for Limbless Sailors and Soldiers – was set up in 1916 to treat soldiers who had suffered the loss of a limb during the war,” explains an article at BT.com. The original leather-bound admissions registers from 1916-1939 have been digitized and placed online at Erskine.org. In many cases, not just admissions are recorded, but patients’ progress, prosthetic fittings and other long-term care details. Ohio Digital Network Collections. The State Library of Ohio recently announced that “over 90,000 new materials from Ohio Digital Network are now discoverable in Digital Public Library of America (DPLA).” Several institutions have partnered to contribute content, including the State Library of Ohio, Ohio Library and Information Network (OhioLINK), Ohio Public Library Information Network (OPLIN), and Ohio History Connection [the state historical society). “The Ohio Digital Network builds on strong digital collection efforts across the state including Ohio Memory and the Ohio Digitization Hubs project. 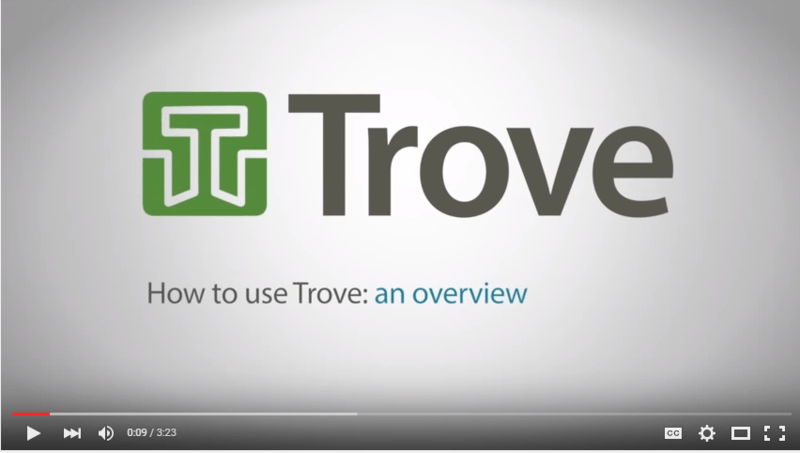 Click here to start exploring Ohio Digital Network collections. These smaller collections are more specific, so they won’t apply to as many of you. But if they DO apply, they may reveal unique family stories or documents. La Florida: The Interactive Digital Archive of the Americas (short videos, interactive maps and digital reconstructions of the colonial lives of a “diverse melting pot” of residents). Didn’t find anything here that applies to your family history? Let the diverse topics and record types in these collections inspire your searches for similar items about your relatives.